On May 19, 1912 John and Rose Neckermann Katzmark gave birth to their first child, my father, Paul Valentine Katzmark. 1915 was a big year for the Katzmark family. Dad's sister Rosemary was born, and the family moved into their new home at 7312 Eberhart Ave. in the beautiful tree lined Park Manor area of Chicago . 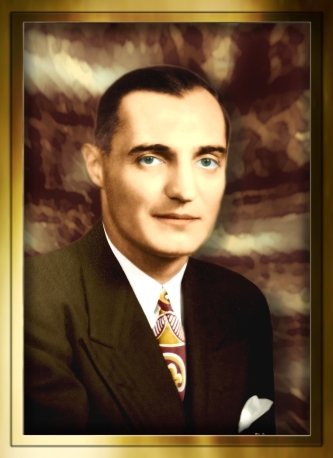 Dad attend St Colombanis grammar school and in the spring of 1930, Dad graduated from De LaSalle high school . Your our NATION'S very best. On October 9, 1934 Dad married my mother Genevieve Marie Johnson. 1939 was a special year for Dad on July 22, 1939 Dad became a member of the Illinois Society of Certified Public Accountants. In 1967 he was promoted to president and general manager of Hart Skis, a division of Beatrice Foods. Dad finished his working career as the financial Consultant to Rosemount Illinois in 1984.